Writer and film maker Richard Gaikowski has been named as a Zodiac suspect by Tom Voigt of the website Zodiackiller.com. Gaikowski reportedly assumed the role of editor for The San Francisco Express Times sometime in the spring of 1969 and, in April of that year, the newspaper changed its name to The San Francisco Good Times. Todd Gitlin was a writer and regular contributor. In a recent email, Gitlin explained, “I was at the Express Times June ‘68-spring ‘69 but not thereafter– not into the Good Times phase.” Gitlin did not know or remember Gaikowski or his co-worker and friend, Blaine Blaine aka Goldcatcher aka Zakatarious– the man who now claims that Gaikowski was the Zodiac. Tom Voigt has selectively cited portions of the SFTE/GT in order to further implicate Gaikowski and paint his suspect as a diabolical murderer using the newspaper to publish cryptic clues. Voigt posted a Good Times cover featuring three photographs depicting actor Peter Fonda, Black Panther Bobby Seale, and guru Satchidananda (who opened the August 15, 1969 Woodstock music festival). According to Voigt’s theory, this three-part cover may have served a sinister purpose. Voigt wrote, “On the very day Zodiac debuted by mailing three ‘rush to editor’ letters to three separate newspapers in the San Francisco area (with each letter containing one third of a code), the Good Times (edited by Gaikowski) just happened to run a cover that was split into thirds. It was the only instance of Zodiac mailing a letter on a Thursday until after the Good Times folded in 1973.” The cover was clearly a product of necessity; the paper was running three different articles about three different people and did not have a photograph which depicted all three men together. I recently viewed the issues of The SFTE/GT which are kept on microfilm at the San Francisco public library. Even a cursory examination of various issues reveals that the newspaper consistently printed notices and advertisements for entertainment events which spanned the spectrum from mainstream to underground theater, film, music, literature and more. The SFTE/GT was not the only Bay Area newspaper to print ads for The Mikado. Voigt wrote: “The Good Times also occasionally ran sensationalistic ‘Zodiac Killer’ headlines that were out of place.” The Zodiac crimes were the subject of ongoing news reports in the Bay Area and the SFTE/GT was only one of many newspapers which printed stories about the case. The Zodiac headline cited by Voigt read, “Zodiac Strikes Again.” The accompanying article was not about the Zodiac case but an astrological horoscope which had nothing to do with the crimes. Voigt has implied that the radical voice of The Good Times indicates that Richard Gaikowski and others who worked for the newspaper were somehow capable of committing extreme acts of violence such as the Zodiac crimes. Those who knew Gaikowski have repeatedly stated that they do not believe that he was capable of such violence or responsible for the Zodiac attacks. The Times frequently complained about police brutality and injustice while parroting the anti-establishment revolutionary tone of the times, yet there is no evidence that Gaikowski advocated the murder of innocent human beings for any reason, let alone for a political cause. The Good Times, like many other counter-culture publications, did adopt a strong anti-police stance which was reflected in its content, yet even this provocative position does not constitute evidence that Gaikowski or anyone else associated with the Times would shoot teenagers at a lovers lane, viciously stab a couple, or murder a cabdriver who was just doing his job. As editor of The Good Times, Gaikowski may have condoned the publication of Blaine’s opinions and point of view; in fact, he may have shared some of the same sympathies. However, such a stance does not equal condoning the kind of unprovoked and vicious murders committed by the Zodiac. Throughout its history, The Good Times printed many stories which promoted the anti-police stance and described the sometimes-violent philosophies of groups which were responsible for bombings, the murders of police officers, and other crimes. Yet even this political posture cannot be considered evidence that Gaikowski or any other Times contributor would advocate the crimes committed by the Zodiac. 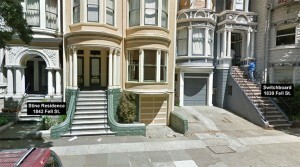 Voigt’s site also features this Google photograph of the two locations in question with Voigt’s captions. Paul Stine did live at 1842 Fell Street, and 1830 Fell Street was, in fact, the home of a switchboard. However, Voigt’s attempt to link Stine to The Good Times, and his suspect, Richard Gaikowski, is based on a false assumption. A quick Google search for “1830 Fell Street” and “switchboard” yielded these results. The switchboard located at 1830 Fell Street was actually the famous “Haight-Ashbury Switchboard,” a fixture of the Bay Area counter-culture in the late 1960s and 1970s. Al Rinker founded the Switchboard in 1967 and wrote this mission statement. “The Switchboard is a volunteer service designed to facilitate communication among people throughout San Francisco, and specifically to serve as an informational and referral source for the Haight-Ashbury community.” As noted on the Wikipedia page and other Internet articles, the Switchboard was quickly overwhelmed by the needs of the counter-culture community and subsequently devoted much of its resources to finding “crash pads” for wandering hippies and assisting “runaways” new to the Bay Area while dealing with worried and irate parents. The Switchboard became a focal point in the Haight-Ashbury district and a legend among those in the counter-culture movement. Hoffman wrote STEAL THIS BOOK in 1970 and the popular anti-establishment treatise was published in 1971. 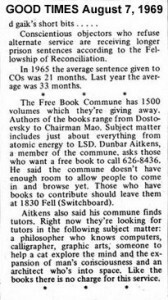 The book notes the phone number of the Haight-Ashbury Switchboard as “387-3575,” the same number listed for the Haight-Ashbury switchboard in an August 1969 issue of The Good Times. Given the nature and purpose of the Switchboard, the fact that The Good Times was available there– along with other underground newspapers from the Bay Area– cannot be viewed as evidence linking Gaikowski to Stine. Blaine claims that Gaikowski delivered editions of The Good Times to the Switchboard, but Blaine has a documented history of exaggerating and even inventing his own stories to suit his needs. The facts indicate that the proximity of the Switchboard to the home of Paul Stine is not credible evidence linking Gaikowski to Stine, and that the house on 1830 Fell Street had no legitimate or significant connection to The Good Times or Gaikowski as Voigt claims. 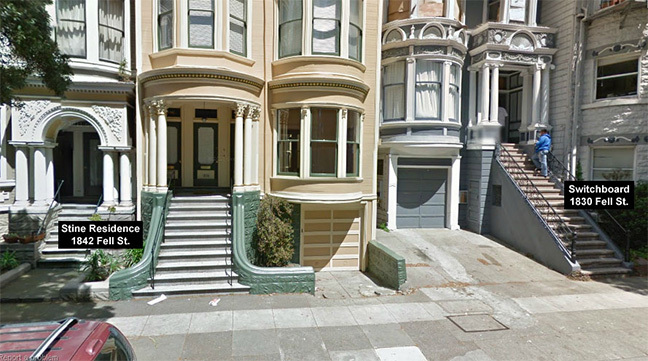 Even Blaine– who worked for the Good Times– described the house at 1830 Fell Street as the location of “the old Haight Ashbury switchboard” and not as the switchboard for The Good Times. Al Rinker ran the Haight-Ashbury Switchboard until 1970 when some of his volunteers assumed control and later moved the operation to 1797 Haight, then to 1921 Hayes St. near Ashbury, and finally to 1539 Haight St. The Switchboard continued to offer services to the citizens of the Bay Area throughout the 1970s and into the 1980s and finally closed in 1986. The Diggers launched the “Free Store” concept in the Bay Area. The San Francisco store on Frederick Street became a popular fixture and, later, others stores opened in New York City. Tom Voigt has posted a photograph of unknown origins which depicts a lengthy handwritten notice for the opening of the “Family Store” in Berkeley, California. The Diggers were responsible for many such stores in the Bay Area, and the organization eventually evolved into a group known by the name “The Free Family.” A handwritten notice from the Diggers, dated 1968, is also similar to the “Family Store” poster. While some of the handwriting samples from The Diggers Papers and announcements may appear somewhat similar to the handwriting of the Zodiac, such similarities are, in fact, common and appear in samples from a variety of sources written by individuals decades apart. At the height of their influence and notoriety, The Diggers were featured in various counter-culture publications such as The Realist. The Diggers were also the subject of various stories in the mainstream newspapers which echoed the opinions of police and other authorities who viewed the group as a nuisance and perhaps even a dangerous force. 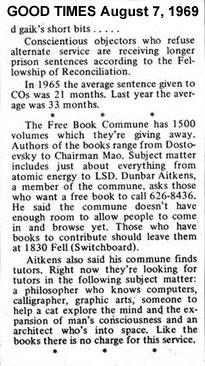 The Diggers continued to publish various papers until late 1969, when the era of peace and love had officially come to an end. Thanks to the violent actions of extremist groups such as the Black Liberation Army, The Symbionese Liberation Army, the Weatherman Underground Organization, and even the notorious Manson Family, the image of the counter-culture community was forever stained by the bloody memories of those who represented the most extreme elements of the movement. In December 1969, radical anti-war activist Bernadine Dohrn addressed a crowd in Michigan and referred to the brutal Tate/LaBianca slayings at the hands of Charles Manson’s “Family” when she said, “Dig it! First they killed those pigs and then they put a fork in pig Tate’s belly. Wild!” Dohrn was the wife of Weatherman founder Bill Ayers, who was suspected in several bombings, including the 1970 explosion at the Golden Gate Park police station which killed Officer Brian V. McDonnell and injured several others. Like the Diggers, the volunteers of the Haight-Ashbury Switchboard, and many others in the so-called “underground” of the Bay Area, the staff of The San Francisco Express Times / The Good Times believed that they could make a difference, and, throughout its short history, from 1967-1972, the Times was home to many different contributors. The essay by Jesse Drew, titled, Good Times Collective, is available on the website FoundSF.org. The San Francisco Good Times established itself as one of the most memorable underground newspapers of the late 1960s and early 1970s, and its influence and impact touched even popular celebrities and figures of the times. Filmmakers Allan Francovich and Gene Rosow produced and directed a documentary about the newspaper titled San Francisco Good Times which featured such notable faces as musician Pete Townsend of the legendary rock band The WHO and famous drop-out and drug advocate Timothy Leary. Neither Richard Gaikowski or Blaine appear in this documentary. The documentary is available on DVD, and can be viewed online. The history of The San Francisco Express Times aka The Good Times reveals no evidence to indicate that Richard Gaikowski condoned or committed the Zodiac crimes. The evidence demonstrates that Tom Voigt has distorted the facts in order to create the illusion of a connection between Richard Gaikowski and the Zodiac. Despite Voigt’s claims, The Good Times switchboard was not located next to the home of Zodiac victim Paul Stine. This falsehood has now been recorded by Internet archives as a “fact.” In his rush to convict Richard Gaikowski in the court of public opinion, Tom Voigt has spawned yet another in a never-ending series of myths and distortions which continue to cloud the historical record. Damn fine work uncovering the truth behind toms misleading (and outright false) statements Mike!